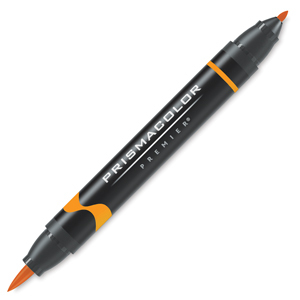 With a small tip for details and a brush tip for larger areas, the Prismacolor Brush Tip Marker lets you change it up whenever the mood strikes! Featuring the same non-toxic, dye-based alcohol ink as Prismacolor Premier Double-Ended Markers, Prismacolor Brush Tip Markers feature a roll-resistant cap and one ink source, assuring consistency of color from both ends. Set of 6 — This set includes Canary Yellow, Crimson Red, Violet, Ultramarine, Dark Green, and Black. This set includes 023 Cream, 131 Deco Yellow, 019 Canary Yellow, 018 Yellow Ochre, 123 Spanish Orange, 015 Yellowed Orange, 014 Pale Vermilion, 016 Orange, 013 Poppy Red, 069 Goldenrod, 093 Burnt Ochre, 012 Light Peach, 170 Peach, 065 Sienna Brown, 061 Dark Umber, 006 Carmine Red, 004 Crimson Red, 010 Blush Pink, 169 Tuscan Red, 001 Process Red, 008 Pink, 007 Magenta, 055 Rhodamine, 053 Mulberry, 133 Deco Pink, 171 Lilac, 050 Violet, 048 Light Cerulean, 039 True Blue, 044 Ultramarine, 042 Violet Blue, 043 Indigo Blue, 145 Blue Slate, 046 Light Aqua, 037 Aquamarine, 166 True Green, 165 Grass Green, 167 Apple Green, 031 Dark Green, 027 Chartreuse, 124 Limepeel, 025 Spring Green, 028 Dark Olive Green, 172 Light Umber, 088 Dark Brown, and 098 Black. This set includes 167 Apple Green, 037 Aquamarine, 098 Black, 145 Blue Slate, 010 Blush Pink, 093 Burnt Ochre, 019 Canary Yellow, 006 Carmine Red, 027 Chartreuse, 144 Cloud Blue, 108 Cool Grey 10, 109 Cool Grey 20, 110 Cool Grey 30, 111 Cool Grey 50, 112 Cool Grey 70, 040 Copenhagen Blue, 023 Cream, 004 Crimson Red, 088 Dark Brown, 031 Dark Green, 028 Dark Olive Green, 168 Dark Purple, 061 Dark Umber, 011 Deco Peach, 133 Deco Pink, 131 Deco Yellow, 156 French Grey 20, 159 French Grey 50, 161 French Grey 70, 069 Goldenrod, 165 Grass Green, 127 Imperial Violet, 043 Indigo Blue, 141 Jade Green, 046 Light Aqua, 048 Light Cerulean, 012 Light Peach, 095 Light Tan, 172 Light Umber, 171 Lilac, 124 Limepeel, 007 Magenta, 053 Mulberry, 016 Orange, 014 Pale Vermilion, 032 Parrot Green, 170 Peach, 125 Peacock Blue, 008 Pink, 013 Poppy Red, 001 Process Red, 055 Rhodamine, 062 Sepia, 065 Sienna Brown, 123 Spanish Orange, 025 Spring Green, 017 Sunburst Yellow, 082 Terracotta, 039 True Blue, 166 True Green, 169 Tuscan Red, 044 Ultramarine, 050 Violet, 042 Violet Blue, 041 Violet Blue Light, 100 Warm Grey 20, 103 Warm Grey 50, 105 Warm Grey 70, 018 Yellow Ochre, and 015 Yellowed Orange. This set includes 017 Sunburst Yellow, 036 Lime Green, 026 Light Olive Green, 001 Process Red, 004 Crimson Red, 005 Scarlet Lake, 006 Carmine Red, 007 Magenta, 008 Pink, 010 Blush Pink, 011 Deco Peach, 012 Light Peach, 013 Poppy Red, 014 Pale Vermilion, 015 Yellowed Orange, 016 Orange, 018 Yellow Ochre, 019 Canary Yellow, 021 Tulip Yellow, 023 Cream, 025 Spring Green, 027 Chartreuse, 028 Dark Olive Green, 031 Dark Green, 032 Parrot Green, 037 Aquamarine, 038 Teal Blue, 039 True Blue, 040 Copenhagen Blue, 042 Violet Blue, 045 Navy Blue, 041 Violet Blue Light, 070 Sand, 072 Eggshell, 073 Flagstone Red, 071 Buff, 043 Indigo Blue, 044 Ultramarine, 046 Light Aqua, 047 Light Blue, 048 Light Cerulean, 50 Violet, 053 Mulberry, 055 Rhodamine, 061 Dark Umber, 062 Sepia, 065 Sienna Brown, 069 Goldenrod, 078 Brick Beige, 079 Brick White, 080 Putty, 082 Terracotta, 095 Light Tan, 097 Warm Black, 090 Walnut, 086 Cherry, 088 Dark Brown, 089 Light Walnut, 093 Burnt Ochre, 096 Blondwood, 098 Black, 099 Warm Gray 10, 100 Warm Gray 20, 101 Warm Gray 30, 102 Warm Gray 40, 103 Warm Gray 50, 104 Warm Gray 60, 105 Warm Gray 70, 106 Warm Gray 80, 107 Warm Gray 90, 108 Cool Gray 10, 109 Cool Gray 20, 110 Cool Gray 30, 111 Cool Gray 40, 112 Cool Gray 50, 113 Cool Gray 60, 114 Cool Gray 70, 115 Cool Gray 80, 116 Cool Gray 90, Clear Blender, 122 Salmon Pink, 123 Spanish Orange, 124 Limepeel, 125 Peacock Blue, 126 Cerulean Blue, 127 Imperial Violet, 128 Parma Violet, 130 Deco Orange, 131 Deco Yellow, 132 Jasmine, 133 Deco Pink, 134 Deco Blue, 137 Clay Rose, 140 Celadon Green, 141 Jade Green, 142 Brittany Blue, 143 Mediterranean Blue, 144 Cloud Blue, 145 Blue Slate, 146 Periwinkle, 147 Greyed Lavender, 149 Bronze, 150 Mahogany Red, 151 Raspberry, 152 Henna, 153 Pumpkin Orange, 154 Mineral Orange, 155 French Gray 10, 156 French Gray 20, 157 French Gray 30, 158 French Gray 40, 159 French Gray 50, 160 French Gray 60, 161 French Gray 70, 162 French Gray 80, 163 French Gray 90, 185 Spruce, 186 Emerald, 187 Leaf Green, 184 Forest Green, 165 Grass Green, 166 True Green, 167 Apple Green, 168 Dark Purple, 169 Tuscan Red, 170 Peach, 171 Lilac, 172 Light Umber, 191 Pale Jade, 192 Avocado, 193 Mint Cream, 194 Cold Stone, 195 Spearmint, 196 Wheat, 197 Green Tea, 198 Muted Turquoise, 199 Mocha Light, 200 Mocha Dark, 201 Cinnamon Toast, 202 Sky Blue Light, 203 Driftwood, 204 Taupe, 205 Parchment, 207 Pale Peach, 208 Ballet Pink, 209 Khaki, 210 Oatmeal, 211 Jet Black, 212 Pewter, 213 Eggplant, 214 Cocoa Bean, and 206 Ash Gray.